Menorca delivered a day of spectacular close racing that saw Magic Blue and Lionheart take the lead in the Wally and J Class classes respectively. Tomorrow, Saturday, a 25 to 35-mile long coastal race is scheduled. Today the nine Wallys and three J Class ycahts sailed two windward-leeward races. Conditions were perfect, with a southwesterly breeze of 10-14 knots, flatter seas and under bright skies. While the right hand side of the course was favoured on Thursday, today's winning tactical call was to stay left as much as possible, especially on the beats. One boat that carried out that plan to perfection was Antonio Cacace's Magic Blue, on which Wally founder and CEO, Luca Bassani, is calling tactics. In the first race, the WallyCentos Magic Carpet3 and Open Season hit the starting line at the pin end and headed to the left hand side of the course. Magic Carpet3 took the early lead and then never relinquished it. With the breeze in the mid-teens, conditions favored Sir Lindsay Owen-Jones' boat, which stretched her lead. In an early indication of the tactics that would play out during the day, Magic Blue held on to the left as much as possible, keeping the number of tacks to a minimum. She finished third on the water, with more than a one minute lead on corrected time over second-placed Open Season. As the breeze weakened in the second race, Magic Carpet3 saw her advantage diminish, while Magic Blue again carried out her left-hand side strategy. The fleet stretched out on the first beat with Magic Blue sailing into the top mark on the port tack layline. Magic Carpet3 again took line honours, but her lead wasn't enough to prevent her from handing first place to her predecessor, Magic Blue. An elated Luca Bassani commented: "Today was a fantastic day! We are very happy because we sailed very well. We made a few mistakes, crew work was excellent, the boat was fast and conditions were perfect. We had two very beautiful races and I am more than happy to be in Menorca. "The left was clearly favoured because the pressure was coming from the left. The breeze was coming and going throughout the day, so the more to the left you were positioned, the earlier you could catch it. Everything played out very well today. "Tomorrow we have a coastal race and it will be completely different. The forecast calls for a northeasterly breeze and we aren't familiar with the tactics. In addition, Magic Blue is very fast upwind, but Magic Carpet3 and Open Season have an edge downwind. In a long coastal race, the two WallyCentos will certainly have an advantage in the long runs." One boat that stood out today was Alberto Palatchi's Galma, whose consistency has kept her on the podium. She was always in the mix in both races, staying close to the top three and fighting a close battle with both Magic Blue and Sensei. A clear demonstration of the day's close racing, Galma lost third place by five seconds in corrected time in the first race and just one in the second one. Antonio Piris, tactician onboard Galma, commented on today's results: "Initially we thought we wouldn't have had such a result because we were caught in some traffic. In the second race we had a nice fight with Sensei and we lost the third place for just one second! Overall, we are happy and today was a day of fun and close racing. " 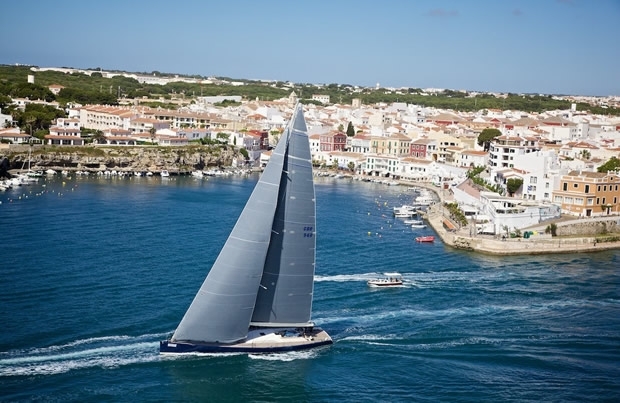 It was J Class racing at its very best today with two challenging windward-leeward races held in 7-14 knots off Menorca. The day began with all three Js sailing out of Mahon harbour, as spectators from the host city were treated to the memorable sight of Hanuman and Ranger reaching out of the narrow channel side-by-side, with Lionheart close behind. In the first race Lionheart opted for the left side of the course, pulling them into first at the top mark, a position they held to the finish. There was a reminder of the power of the Js at the second windward mark, when a member of Ranger’s bow team was flicked overboard by a spinnaker sheet, before being quickly recovered by a chase boat. The second race saw the three J Class yachts racing head-to-head from start to finish of the two-lap course. Ranger led off the start at the pin end, with Lionheart crossing the line on port. When Lionheart tacked back onto starboard, Ranger was ahead, with Hanuman gaining metre by metre. The three boats rounded the top mark with just over one boat length separating Ranger in first place from Lionheart in second, and Hanuman only two lengths behind in third. At the first leeward gate Ranger and Lionheart split, and crossed tacks upwind as Lionheart repeatedly ducked Ranger’s transom, but as the fleet approached the layline it was Lionheart which took the advantage to round in first place. Lionheart held on to win, as Hanuman and Ranger came down the final run on port gybe, with Ranger slightly ahead and to leeward. Hanuman’s only option to get ahead of Ranger was to gybe onto starboard and take Ranger away from the three boatlength circle of the pin. A penalty was awarded against Ranger for failing to keep clear. Lionheart skipper Bouwe Bekking said the race had been tactically challenging: “We had a port start – we were a little bit wrong with our timing and I think you just have to commit, and actually it worked out well because we were going really fast, so with all the tacks it was still looking nice. “Then I made a little mistake when I tacked onto Hanuman, but I should have kept going because the left became so strong. In those situations you can either keep going and hope for the best, but I just decided to limit the losses andtack back. We peeled Hanuman off really nicely. Hanuman’s tactician 470 Olympic gold medallist Kevin Burnham was also enjoying the challenge. “The competition with the other boats is just great. We happened to find a little bit more upwind speed on the second beat of that second race which helped us get back in the mix, and with all three of us together it probably looked very spectacular! “Everybody knows each other in this class and we’re all out to win, and it’s that competitive spirit which makes the J-Class so inviting."